Another angle (pardon the pun if you get my drift) of the Taiji Dolphin Advocates is to educate people about the link between the drive hunts and the live capture for human entertainment industry. This is where the real money comes from and this is what is the motor of the ghastly enterprise. If you are invited for a day out at a SeaWorld or other similar set ups, the environmentally and dolphin/whale friendly response would be “Pass” but not in the sense of buying a ticket but with the intent of declining the chance to prop up this inhumane trade. Captivity kills as for every dolphin/whale that you see in a facility there are many more killed. Think that the dolphin is smiling? Think again. He/she may have witnessed their family being slaughtered or if he /she has been born in captivity, it is possible that ancestors were slaughtered. They are literally dying to entertain you. If humans do not like a job, at least they can not turn up or leave and look for another. Not so for the dolphins. They are serving a life sentence in a prison for committing no crime except for being non human. In these days of advanced technology live dolphins/orcas etc could be replaced with state-of-the-art virtual reality and animatronic exhibits. 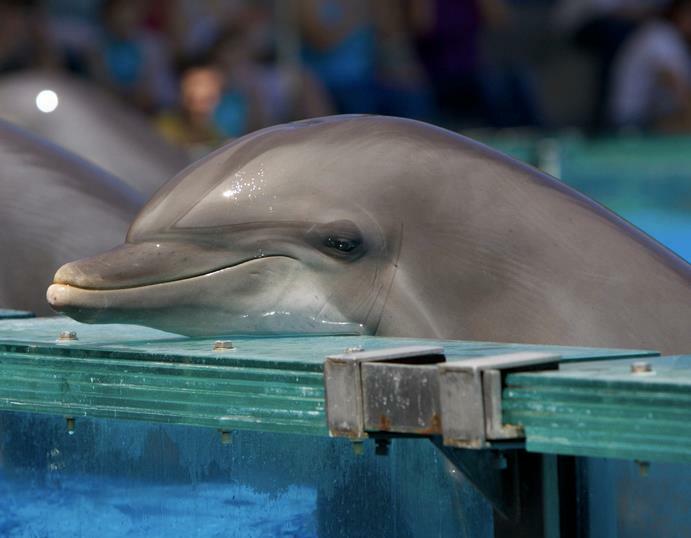 This entry was posted in Dolphin, Environment, Taiji Terror Tales, whales and tagged Dolphin Show, Seaworld, Taiji Terror Tales. Bookmark the permalink.